Nick Blackwell remained in an induced coma last night but could be brought out of it in the next 24 hours. Blackwell collapsed shortly after losing his British middleweight title to rival Chris Eubank Jr at the Wembley Arena on Saturday and was found to have a small bleed on the brain after being taken to hospital. According to BBC reports, a family spokesman said the 25-year-old’s condition was ‘not deteriorating’ and, though heavily sedated, he could be brought round after undergoing further assessment today. The Trowbridge fighter’s family expressed their gratitude regarding messages of support they have received. Blackwell’s plight has brought the safety protocols in boxing into question, with referee Victor Loughlin criticised forhis handling of the bout. 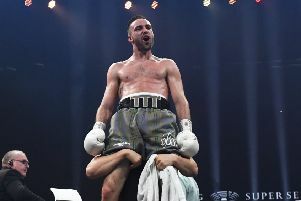 Loughlin waved the fight off during the 10th round, as the ringside doctor had advised him to because of the swelling over Blackwell’s left eye, although some commentators have argued it should have ended much earlier,.